The IZI-Link DMX interface is needed to setup an IZI-Link system. An IZILink system utilises powerline communication to transmit data over a low power voltage network, allowing you to control, monitor and configure each IZI-Link enabled product. This technique eliminates additional control wiring to IZI-Link enabled LED-spots and LED-drivers which make the installation more reliable and easy to install. The IZI-Link system can easily be scaled into a larger network by adding IZI-Link interfaces. 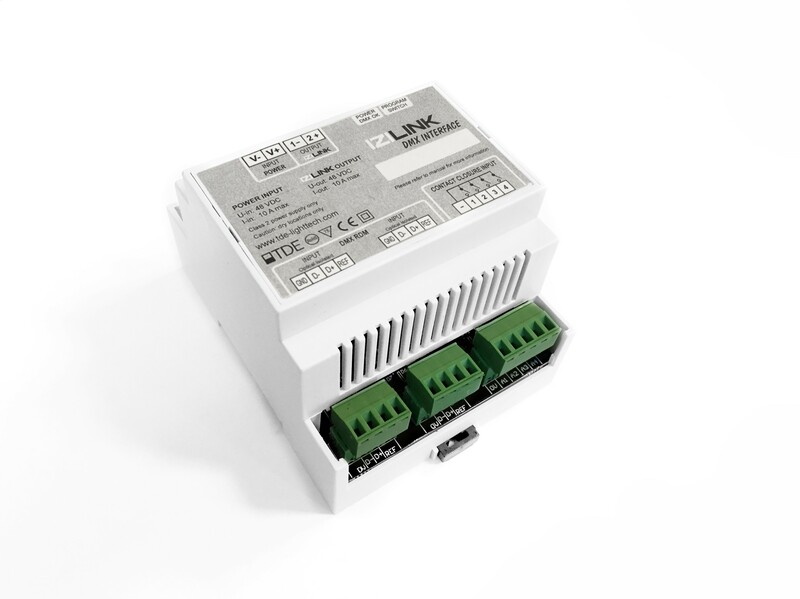 The IZI-Link DMX Interface is controllable through DMX-512 and has 4 additional galvanically isolated contact inputs to override DMXcontrol for use as emergency contacts or local control switches.